In the design of unix and unix-based OS-es a clear distinction is quite visibly present with regards to privileges. I think it has been stressed with sufficient urgency that the root user is not who you want to be while going about your merry way computing the maximum number of clowns that would fit into your Prius or other vehicle. Superuser privilege is something that is to be respected and there is a good reason for this. In the short time that I have been involved with computers and specifically unix-based OS-es I’ve had too much encounters with seriously screwed up systems because someone disrespectfully smacked a sudo in front of a command that was not doing what the user expected. The problem with this approach is that many do not have a freaking clue what they are actually doing. The fact is that superuser is god on your machine. Anything goes, meaning anything can be screwed if not careful and there is no undo function in case things go awry. You should always know what is happening if you choose to sudo something. Installing a script from someone with superuser privileges is not a good idea , unless you have read the code and are certain it is not downloading another script you haven’t read to be executed as well. Otherwise you have no idea what is being done under the umbrella of superuser clearance. Performing actions as superuser may create files that are only accessible by superusers, inadvertently requiring you to have superuser privilege everytime you will need to access these resources. It a nasty side effect of going the sudo route on things that weren’t meant to be sudoed. Linux users using RPM or Aptitude generally have to install packages with superuser privileges because these applications are being installed into directories which are only writeable to the superuser (e.g. : /lib/bin, /etc/bin). 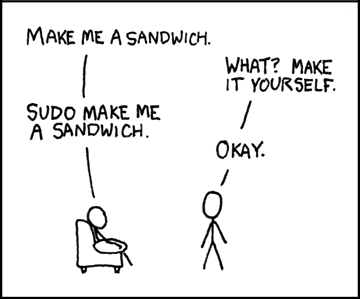 The rule here is to only sudo commands that you trust. If the packages of interest are from trusted repositories go right ahead, otherwise proceed with caution. OSX users trying to brew install something generally should not resort to prefixing sudo to their brew install command. Brew symlinks installed executables into /usr/local. On my own mech I happen to be a member of the admins group and admin-members have write permission on /usr/local. No reason to sudo here being the simple me is enough. Installing gems, node packages or any other packages for whatever env you are using with sudo is generally bad news. Generally if you have rvm, virtualenv or nodeenv set up properly you should not need to sudo something ever. The big problem here is that all the code is generally pulled from repositories somewhere on the web. You probably have no idea what is in there. It could be wiping your home directory or installing some other nastiness you don’t even want to think about. Bottomline be more conservative in superuser usage. If you frequently end up sudo-ing commands it is probably a signal that your system is seriously screwed up and it might be due for a fresh install – the right way .